Our In-Line screen filters are a less expensive alternative to our API screen filters. (See API screen filters below.) These basic screen filters are used to filter relatively clean water such as water from wells. They are good for filtering sand out of water which can clog irrigation tape. These filters are not recommended for surface water containing algae. Disk Filters are used when you need to clean dirty water for drip irrigation systems. These filters can handle more dirt and debris than screen filters before cleaning. The way a disk filter works is a stack of disks are pressed together. These disks have tiny grooves that allow clean water to pass through while trapping the dirt and debris. To clean, remove the stack of disks and wash between them. Don't forget your insert fittings. 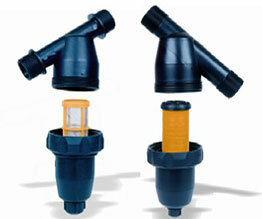 These high quality disc filters from Eurodrip are built to last and provide many years of service. The filter’s construction provides easy access to the filter cartridge for cleaning with a smooth action clamp that is easily opened and closed. These disc filters are a true value for the price. Replacement filters are also available. API Spin Clean Screen Filters are one of the best on the market. These filters are used to clean water for drip irrigation systems. They clean well water or relatively clean water. They are very good at filtering sand out of water which can clog irrigation tape. Not recommended for surface water containing algae. Comes with a 150 mesh stainless steel screen.